You are the captain of a 50,000 tonne container ship on a tight schedule. The ship’s EUR100,000 bronze propeller has been damaged on ocean debris at night. Berthing at Europe’s biggest seaport, Rotterdam, you contemplate a painful mental calculation: removal of propeller underwater: EU35,0000 or more; courier despatch to original manufacturer for repair: EUR10k or more. Propeller repair work, plus shipping spare propeller to Rotterdam from Seattle; thousands more euros. Then add the dead-time cost of ship docked in port, redundant, for 20 days or more. Should you phone the shipping agent now? But fear not, because RAMLAB is here. 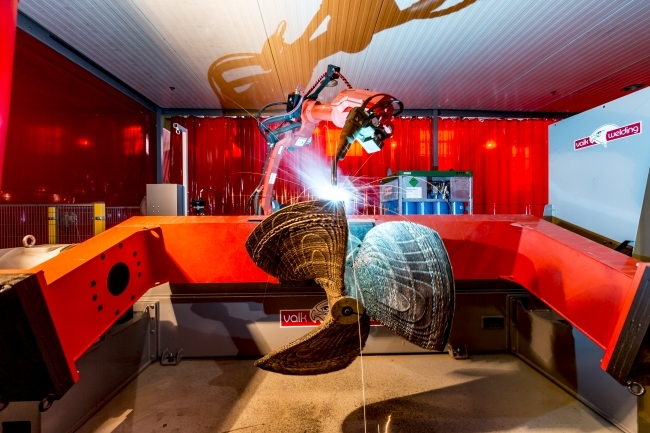 The Rotterdam Additive Manufacturing Laboratory will, literally, print you a new propeller. Launched in 2016, the facility manufactured the world’s first, class-approved propeller at the end of 2017 using a wire arc additive manufacturing, or WAAM, process. WAAM is a high rate metal deposition process, able to deposit 1-6kg per hour. The 100% printed propeller is known as the WAAMpeller. “The cylindrical shaft is the starting base substrate to which a cone is deposited using the WAAM process,” says Kelvin Hamilton, Sr Technical Consultant at Autodesk, who is working closely with RAMLAB. After the conical hub is prepared, the blades are deposited weld bead-by-weld bead, layer-by-layer until the full propeller is formed. “This is a wholly constructed, new build part, taking a substrate and adding features to make a brand new component,” Kelvin adds. Conversely, with a repair job, the engineers have to remove the damaged section of the part, create a toolpath, print the new section, then do the finishing – grinding or milling – to produce the completed repair. “Typically in commercial marine this would be manual or robotic grinding and then human polishing,” Kelvin adds. RAMLAB and its partners aim to automate as much of both workflows where practical. Initial success for the RAMLAB consortium saw the development, production, testing and class-approval of the WAAMpeller product by Bureau Veritas, the global marine inspection and certification group. So how long does printing a propeller take? Build time varies depending on the material, part size and other factors like the number of machines printing. Could the process be scaled up to make multiple propellers in series? With a single robot, the throughput time for multiple propellers would be too slow and unviable. With numerous machines printing at the same time, it is possible to improve productivity, Kelvin says. A typical ‘small’ commercial propeller, with a mass of 180-200kg, like the WAAMpeller, took 200 hours – about a week and a half – to print without the finishing. “This was the first time we tried this so there is a lot of room to improve the process and productivity,” he adds. “We can make one or two propellers in two weeks.” Casting is a better process for making more than 10 units but this might take four or six months to receive the new props. Aligned to this calculation are the vast costs of commercial ships stuck idle in a port as they wait for spare parts to be ready. RAMLAB is also a demonstrator for the concept of localised, niche production. To avoid such dead-time costs, there could be other RAMLABs in Rio de Janeiro and Tokyo, or Hamburg, or Sydney. The alternative is a supply chain with warehouses full of spare propellers in hundreds of variants in strategic locations, which might never be used. Far better to print expensive parts on-demand. This is RAMLAB’s ultimate business plan. At the moment, RAMLAB is an R&D centre, developing the best manufacturing processes and knowhow for this work. Vincent Wegener, Managing Director of RAMLAB, says “We are at the stage of perfecting the wire arc technology first. Our long-term vision is to make and repair these parts on-demand,” he says. And it’s not only props on the printing menu. RAMLAB is working on projects involved with various components related to the offshore and marine industries such as rudders, struts, and hoisting equipment. And Wegener points to another advantage of WAAM – it can produce hollow parts. In early June, RAMLAB announced a project with Dutch offshore engineering company Huisman to make a large hollow offshore crane hook using the WAAM technique. The four-prong, Huisman-designed hook will save significantly on material usage and production lead time. The material used for the propellers is a nickel aluminium-bronze alloy but any metal produced in wire for welding can be used in WAAM. And it doesn’t stop with marine applications. “There is growing interest in RAMLAB’s service from the aerospace industry and now construction – really any industry making large expensive parts is suitable,” Wegener says. The printed propeller has to retain its shape, crucial for a component whose blades’ geometries are designed precisely to convert the best ratio of rotary motion into forward thrust. FARO, the specialist metrology solutions company, with deep experience in measuring additively manufactured parts, stepped in. They used the FARO ScanArm to accurately scan the propeller to see if any deformation had occurred in the welding or ‘printing’ process. The advantage with the scanning technology, known as “blue laser” scanning, is that it can measure a substrate without contact on a shiny surface, explains Bart Rook, sales engineer Benelux and Scandinavia at FARO, who was responsible for scanning the propellers. The ScanArm measures virtually any surface, including polished surfaces, to an accuracy of 50-60 microns, a higher tolerance than this propeller application needs which is about 0.5 millimetres. Scanning is done at different stages through the build process but mainly the post-polishing stage, and most scans take up to 20 minutes. Rook also used the FARO ScanArm for small surfaces. He says the advantage over competitors’ systems is to combine a hard probe, to create the alignment, with scanning. “We took a touch probe alignment on the machine, which is more accurate than scanning, used that as the base reference so later on we were able to use the ScanArm to scan the blades from that reference,” says Bart. The measurement data compiled from FARO ScanArm is exported for use in Autodesk’s 3D measurement and metrology software, PowerInspect. Using PowerInspect, scan data were compared to the expected 3D CAD geometry to see if the new part matched the design intent. Overall the scans showed a very good agreement between the as-built part and the CAD and it also illustrated areas where improvement can be made to the deposition process. Business risks that RAMLAB has faced include setting up all the partnerships including Autodesk, Damen Shipyards, marine technology specialist Promarin, welding partner Valk Welding and Lincoln Electric and others, and managing their inputs and expectations. RAMLAB had to overcome how the material properties will change when fabricating such big parts, what the structural guarantees were after so many hours of welding, the challenge to get Class-approval from Bureau Veritas and other industry certification bodies, etc. “The main challenge was that this had never been done before,” Wegener says wryly.